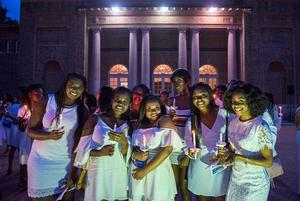 HAMPTON, Va. (September 7, 2018) – New students were received into Hampton University officially during the 2018 New Student Induction Ceremony which took place at Memorial Church on Friday, August 24, 2018. During this long-standing tradition, new students are formally introduced to the university and become a Hampton lady or a Hampton gentleman. Dressed in white, the Hampton ladies were escorted to the Church by the Hampton men, all dressed in formal suits. “Hampton University welcomes the class of 2022. We know that the next few years will be exciting, challenging, and fulfilling as you continue the legacy of education of those before you,” said Hampton University President, Dr. William R. Harvey. Several members of the Hampton University community spoke to the crowd of new students, including Melinda Steele, Assistant Director for Young Alumni, who gave the Induction Address and welcomed the Hampton University class of 2022. There were prayers and songs of faith and the students were taught Hampton University’s Alma Mater. Other speakers included Dr. Barbara Inman, Hampton University Vice President for Administrative Services; and Mr. Michael Adams, President of Quintessence. Jordan McKinney, graduating senior, political science major, and Student Government Association (SGA) President, left the students with encouraging words for their futures at Hampton University. “It’s your will power that separates you from the pack, it’s your drive that will propel you forward. Throughout the next few years, you will encounter people and experience new things that you never thought you would. You will do things that you never thought you would be capable of. You will be tested to your limits, pushed like never before, tried like never before. But I will tell you, keep the faith. You will prevail,” McKinney said. After the Induction Ceremony, each new student walked over to the Robert C. Ogden Auditorium to begin the Candle Lighting Ceremony. Every candle each student holds represents the quest for knowledge and learning at Hampton University. After the ceremony, each new student will be on their way to becoming an official Hamptonian.